Labyrinth ~ Spiritual Path: “The labyrinth is an ancient design found in most cultures; some examples date back more than four thousand years. Labyrinths have probably always been used as spiritual tools. A labyrinth has only one avenue. Its geometry combines the circle and spiral into a purposeful meandering path. The way in is the way out. There are no blind alleys. 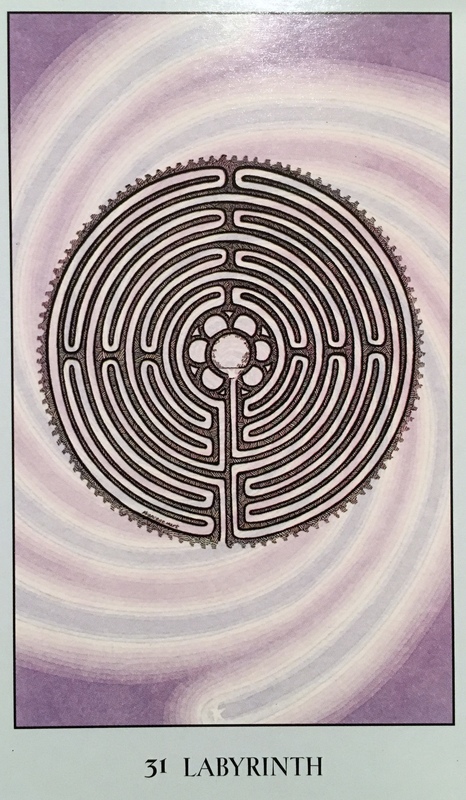 A profound tool for meditation, the labyrinth is a metaphor for your spiritual path. Also a feminist Christian icon, the labyrinth embodies inspiration heightened awareness and can serve as a psychological and spiritual tool for self exploration. There is only one path available to you right now, and it will deliver you right into the heart center. We love to skirt around things, avoid our problems and keep ourselves busy with drama and distractions. Yet this time, the message is clear, the path is one to be traveled alone, right to the center of your Soul. This may be in preparation; to meet the level of growth; to complete a stage of transformation; or to catch you up to where you need to be. Whatever the reason, the Labyrinth awaits you, and it must be faced before you can move on. Know that the Labyrinth must be approached with reverence and sacred ceremony. It is to be navigated with curiosity; openness and receptivity. It cannot be rushed, it is a journey in and of itself. It must be undertaken with commitment; an agreement with self to enter and see it through. Yoga, meditation, contemplation, silence and the breath are all tools that can be used to guide you through. You may not find the center the very first time you try, but you must go back again and again until you do; fully devoted to finding the wisdom within. Although you will undertake this journey alone, your angels and guides will always be by your side, and can provide valuable knowledge and encouragement along the way. They will lift you up when you are flagging; and they will cheer you on when you are heading the right way. They will answer you when you call, and give you clear signs and messages when you open your awareness to them. See this time as a gift rather than a challenge, and know that when you reach the center of the labyrinth; you will find everything you seek. The Universal Wisdom; hidden inside you all this time is yours. You are, and you have, everything you need. You just have to uncover it. Find your true heart center. Follow the path of the Labyrinth.